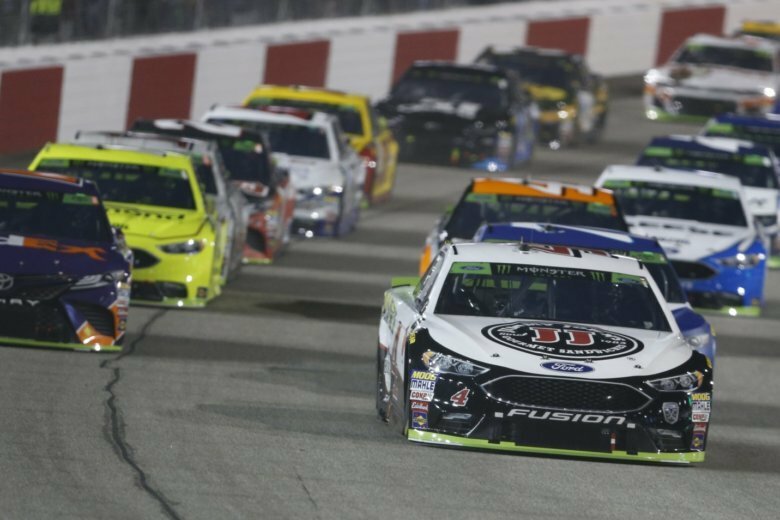 Kyle Busch passed Brad Keselowski with 38 laps to go and held off hard-charging Kevin Harvick to win the NASCAR Cup Series playoff race at Richmond. Busch won for the sixth time in his career on the 0.75-mile oval of Richmond Raceway, and for the first time in the fall. Harvick closed a gap of more than 1.5 seconds over the final few laps, but was not able to deprive Busch from tying him with a season-best seven wins this season. Martin Truex Jr. has given up the lead after dominating the first two stages at Richmond Raceway. Truex was penalized for an uncontrolled tired during put stops after the second stage and sent to the back of the longest line.That left him in 19th position while Chase Elliott briefly grabbed the lead. Elliott was followed by Harvick, Aric Almirola and Brad Keselowski, and it was the red-hot Keselowski who surged to the lead. Keselowski is third overall in the playoffs and has won the last three races. Martin Truex Jr. is creating a mirror image of Joey Logano’s spring performance at Richmond Raceway. The defending series champion and points leader has padded his lead by winning the first two stages of Saturday night’s NASCAR Cup Series race. Logano swept the first two stages in the spring, both run without an on-track caution, and that’s where Truex hopes to part company. Logano was unable to close the deal, winding up fourth. Pole-sitter Kevin Harvick finished the stage second, followed by Aric Almirola, Chase Elliott and Brad Keselowski. Keselowski is seeking his fourth consecutive victory in the series. The NASCAR Cup Series race at Richmond raceway is unfolding much like the race here in the spring. In that one, Joey Logano led throughout both the first and second stages, and the race went 353 laps before the first on-track caution flag. This time, Martin Truex Jr. grabbed the lead from Kevin Harvick on Lap 41 and was still enjoying a big lead over Harvick under green with 30 laps left in the stage. After Denny Hamlin was forced to pit under green during the first stage and raced himself back into the top 10 before 100 laps had been run, Clint Bowyer, Logano and Dave Blaney were among the drivers who pitted under green with about 40 laps to go, hoping to use up a set of tires to get traction that would allow them to race up through the field over the final laps of the stage. Martin Truex Jr. has won the first stage in the NASCAR Cup Series playoff race at Richmond Raceway. Truex, the defending series champion, started third but grabbed the lead on Lap 41. He was followed by pole-sitter Kevin Harvick, Brad Keselowski, Chase Elliott and Kurt Busch. The stage was especially eventful for local favorite Denny Hamlin. Hamlin, who grew up about 20 miles from the track, started the night 16th in the playoff standings and with hopes of winning stage points and a top finish. He got spun by Ricky Stenhouse Jr. about halfway through the opening stage, had to pit under a green flag and scrambled to get back on the lead lap before the stage was over. By the time the stage was completed on lap No. 100, Hamlin had climbed all the way back up to the ninth position.